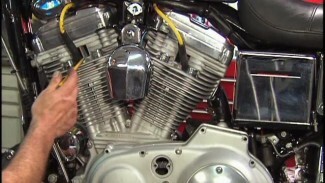 In this video, Mike walks us through Milwaukee Eight Harley air cleaner inspection, cleaning, and replacement. The Harley air cleaner should be inspected every five thousand miles or earlier if riding occurs in harsh environments such as gravel roads, dirt roads, or any type of dust filled environments. The stock Harley Davidson air filter can be cleaned in lukewarm water with a mild detergent. Do not strike the element on a hard surface to dislodge dirt and debris. Allow the filter element to air dry or use low-pressure compressed air. Blow from the inside out. Do not use Harley air cleaner filter oil as the element is only a paper/wire mesh. The element is sufficiently cleaned when it can be held up to a strong light source and light is uniformly visible through areas of the element. Replace the filter element if damaged or if the filter media cannot be cleaned adequately. It is important to inspect the condition of the breather tubes. The motor’s crankcase vents into the air filter through these breather tubes at the top corners of the heads. Venting into the air element is important to be compliant with emissions regulations but more importantly; motor damage or malfunction can occur over time if venting is restricted. It is important to take the time to clean the throttle body opening and the air box when servicing the Harley air cleaner element. It is counterproductive taking the time to properly clean the air element only to reinstall it into a filthy air box. Clean the air box with a clean rag and a mild brake cleaner. 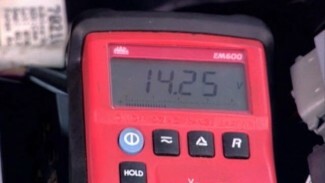 It is of utmost importance that dirt and debris are not introduced into the throttle body opening as this passage leads directly to the intake, and then, the motor. This, ironically, is the same reason a clean air filter is vitally important.